President Park Geun-hye is accused of a growing influence-peddling scandal. 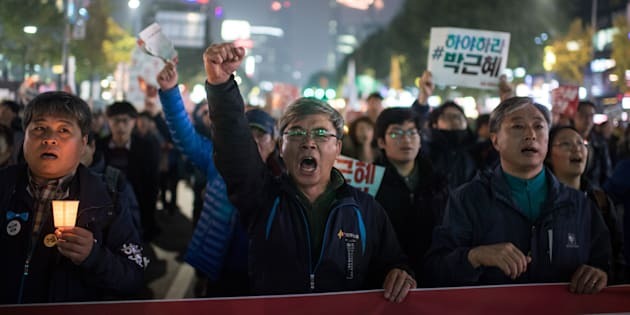 SEOUL (Reuters) - Tens of thousands of South Koreans protested in central Seoul on Saturday in one the largest demonstrations in the country’s capital for years, calling on embattled President Park Geun-hye to resign over a growing influence-peddling scandal. Roughly 43,000 people were at the candle-lit rally early on Saturday evening, according to police. Organizers said a growing crowd of 100,000 had assembled, making the protest one of the biggest since demonstrations in 2008 against U.S. beef imports. Park Geun-hye has been rocked by a scandal involving an old friend who is alleged to have used her closeness to the president to meddle in state affairs. Park has pledged to cooperate with prosecutors in an investigation. Koreans have been angered by the revelations and say Park, the latest South Korean leader to be embroiled in a scandal involving family or friends, has betrayed public trust and mismanaged her government. Her approval rating has slipped to just 5 percent according to a Gallup poll released on Friday, the lowest number for a South Korean president since such polling began in 1988. Police said they had deployed 17,600 officers and 220 units including buses and mobile barriers to Saturday’s protest. Police in riot gear lined the alleys and streets leading to the presidential Blue House as the main body of the demonstration began the march through central Seoul. Park has sacked many of her immediate advisers over the crisis. A former aide, Jeong Ho-seong, was arrested on Thursday on suspicion of leaking classified information, a prosecution official told Reuters. “Even though we’re just students, we feel like we can’t put up with this unreasonable society anymore so we’re participating in this protest with like-minded friends,” said Byun Woo-hyuk, an 18-year-old high school student holding a banner calling on the president to resign.